Every year on November 11th, the Chinese people celebrate Singles‘ Day and all the Chinese online shops have huge sales. But how huge Singles‘ Day really is, is probably not well known to us here in the western world. Therefore, we have collected the most interesting facts and numbers regarding this special day, Alibaba Group (who also runs AliExpress) and have compared this information with Amazon, which is probably better known to most of us. For starters: On this years Singles‘ Day, Alibaba has generated a record 168.2 billion yuan ($25.3 billion) in sales, which has outperformed 2016 Single’s Day at noon already. Nevertheless, in our infographic, we are comparing the numbers of 2016 to be fair for both companies. Amazon’s own Prime Day exists since 2015 and has best-price-offers exclusively for Prime Members. Singles‘ Day, on the other hand, is a holiday, that has emerged in 1993 at the University of Nanjing in China, to celebrate being single. Over the years, this tradition has spread throughout China and also internationally. Big companies soon started to take the opportunity to go into marketing for special deals for singles. Today, Singles‘ Day is the world’s biggest shopping-event. As a sidenote it needs to be said, that Alibaba and Amazon have a differrent business model – and we are fully aware of that. While Alibaba.com is rather a B2B wholesale platform, Amazon is a B2C customer portal with its own warehousing. The Alibaba Group does not have their own warehouses, it is only technology provider for other companies to buy and sell their products. 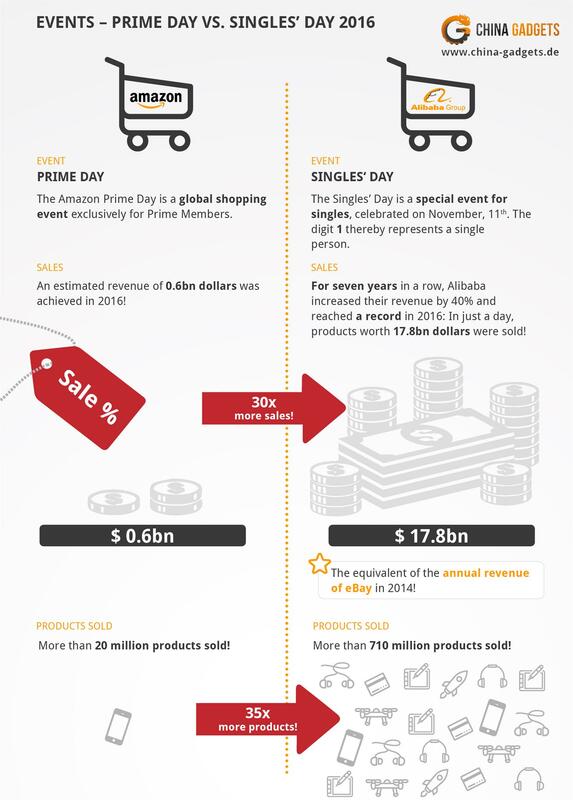 I admit, comparison of Prime Day and Singles‘ Day is not really fair. Prime Day is only for a limited number of people (Amazon Prime Members) and Singles‘ Day is for the whole world’s population. Nevertheless: Prime Day is the most successful day in Amazon’s history every year – even more successful than Black Friday or Cyber Monday – therefore we have taken Prime Day as a comparable shopping-event. But even if we combine revenue of Prime Day, Cyber Monday, Black Friday and Thanksgiving and even if we do *not* only take Amazon, but the whole U.S. retail shopping on these days, into account, Singles‘ Day outperforms the combined revenue of four huge shopping days by far! 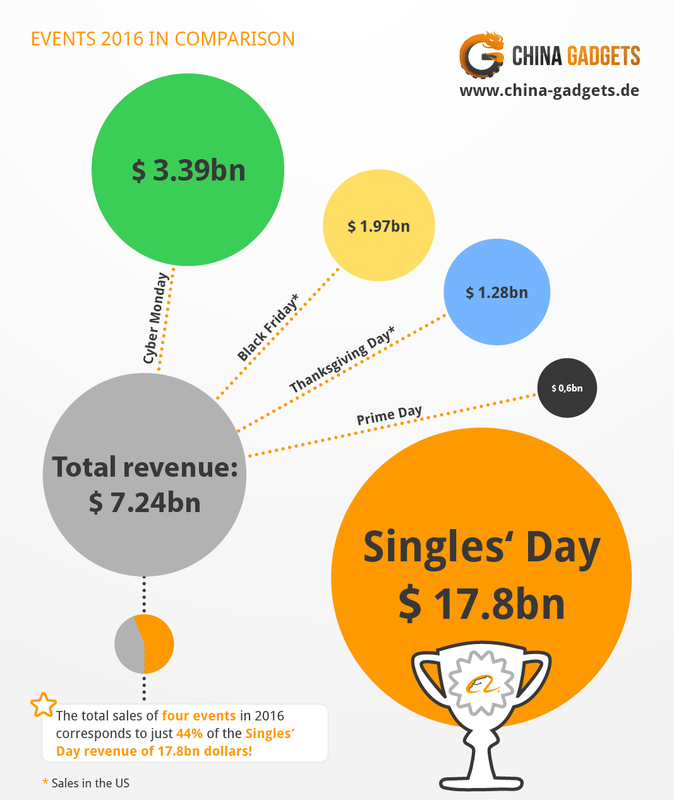 Or the other way around: The combined revenue is only 47% of the revenue of Singles‘ Day. 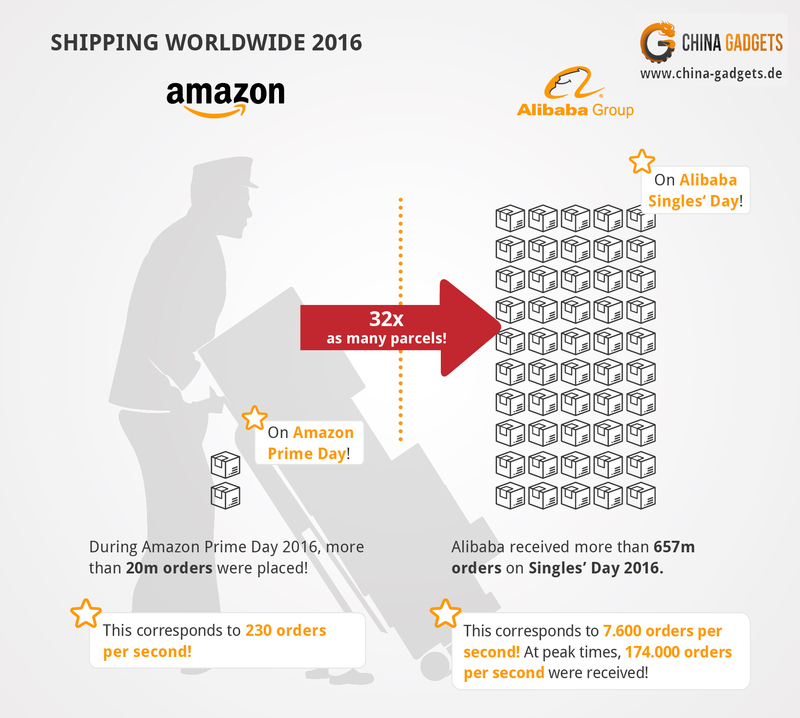 The number of orders in 2016’s Singles‘ Day was at over 650 million. As a comparison: Amazon’s Prime Day only had 20 million orders. To be more exact: In average, there were 7.600 orders every second at Alibaba Group, while in peak times, even 174.000 orders per second were counted! Amazon only had 230 orders per second in average. In our infographic, we also give you some more insights into the companies founders and the number of their employees needed, to be so successful. Please find below the infographic as a PDF Download (alternatively, here also available as PNG). We hope you find the insights and comparison as exciting as we do and you could take some new information home with you today.